Muscle spasms that feel like electric shocks are one of the lesser recognized menopause symptoms women can experience throughout mid-life, leaving them wondering exactly what is going on and if they should be worried. Continue reading about electric shock feelings in muscles, including what can cause them and when you should bring them to the attention of your doctor. Why Do I Have Electric Shock Feelings in My Muscles? Muscle spasms that feel like electric shocks happen to the young and old alike, and they can be caused by a variety of conditions and circumstances. However, for middle-aged women who are nearing the end of their fertile years and still in physical tip-top shape, the most common cause is hormones. As women are passing through the menopausal transition, their ovaries are beginning to decline hormone production as they come to the end of their fertile years. Accordingly, levels of estrogens drastically fluctuate, provoking many symptoms characteristic of this time, such as hot flashes, mood swings, night sweats, and even electric shock feelings in muscles. Electric shock sensations felt due to hormonal depletion can occur throughout the body, including the legs, along the spine, arms, neck, and chest. Electric shocks in leg muscles, specifically, can be caused by anything that induces inflammation or traumatizes spinal cord membranes or vertebrae, thus leading to severe shooting pain down the legs. These conditions and circumstances include arachnoiditis, meningitis, herniated disc, epidural disc prolapse, epidural injections, infections, and many more. In general, women who experience electric shocks in leg or calf muscles at random should generally not be concerned as long as their occurrence is not persistent. They can be thought of as an inconvenience more than anything if they leave them in temporary discomfort, but still able to walk. In order to track incidences and frequency, keep a journal, noting down time of day, intensity of pain, activities performed, etc. In this way, you will be able to document any trends that develop. Also, women who wish to tackle the root cause of hormonal imbalance head-on can do so by following effective electric shock sensation treatments, which focus on intervention involving simple lifestyle changes paired with natural medicine. However, if electric shocks in leg muscles impede your ability to perform daily tasks or walk, consult with a doctor for a correct diagnosis. In these circumstances, it is likely that a cause other than hormones is at fault. 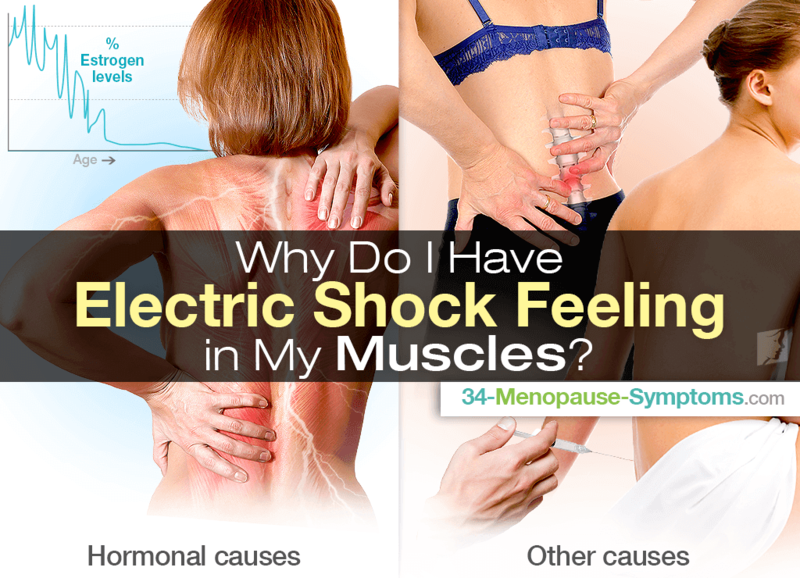 In conclusion, electric shock feelings in muscles of menopausal women are commonly associated with the hormonal imbalance taking place in their bodies as they transition out of their fertile years. However, if the pain and shock sensations are centralized to the legs, it is also possible to be caused by conditions or circumstances that have caused inflammation or trauma in spinal cord membranes or vertebrae. If they occur at random, there is generally no need for concern; the sensations would be a bother more than anything. However, persistent pain and occurrences should be brought to the attention of a doctor.